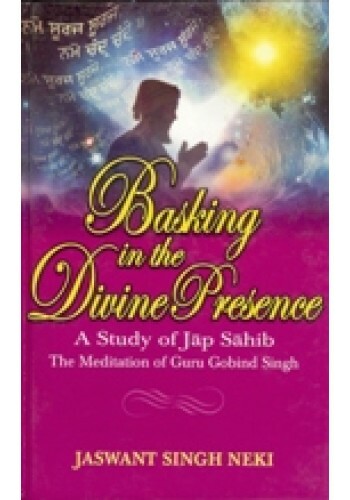 Jap Sahib is one of the celebrated spiritual compositions of Guru Gobind Singh, the tenth Guru. Like the Jap ji of Guru Nanak Dev, it is also a part of the daily pre-dawn liturgical service of the Sikhs. The Jap ji provides instruction in spiritual praxis, and introduces one to the different spirit-scapes on the way to the Transcendent Reality. Jap Sahib straightway dwells upon God through His attributive names in exquisitely mellifluous verse. Its composition must have become possible in a state of profound meditation. In it at places, there is considerable repetition of the terms of salutation. But that is the essential pattern of Jap. Still, however, monotony is kept in abeyance by varying the salutary phrases, at intervals, also in consonance with the change of the metre. It employs amazingly live rhythms. Hence, recitation of this composition makes one feel as if one is hearing the echoing rhythms of the Cosmic Drum. 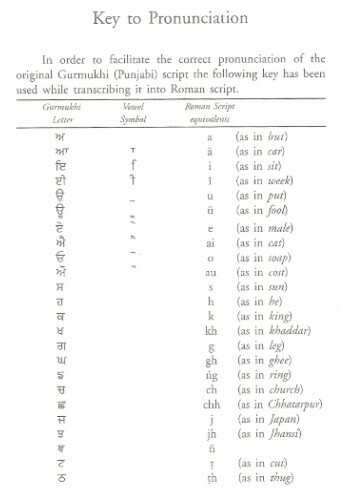 Stylistically also, the two compositions - Jap ji and Jap Sahib - are mutually quite distinct. 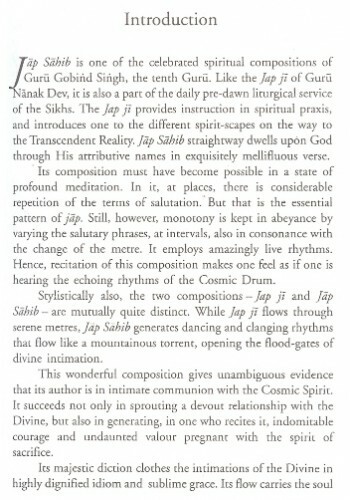 While Jap ji flows through serene metres, Jap Sahib generates dancing and clanging rhythms that flow like a mountainous torrent, opening the flood-gates of divine intimation. This wonderful composition gives unambiguous evidence that its author is in intimate communion with the Cosmic Spirit. It succeeds not only in sprouting a devout relationship with the Divine, but also in generating, in one who recites it, indomitable courage and undaunted valour pregnant with the spirit of sacrifice. Its majestic diction clothes the intimations of the Divine in highly dignified idiom and sublime grace. Its flow carries the soul of the seeker with it through the portals of sanctimonious inspiration. It undoubtedly mirrors an intimate numinous presence of the Divine that must have been experienced by its author. Every one of its ten different metres has its specific distinctive lilt; and together they weave a consistently valorous beat. 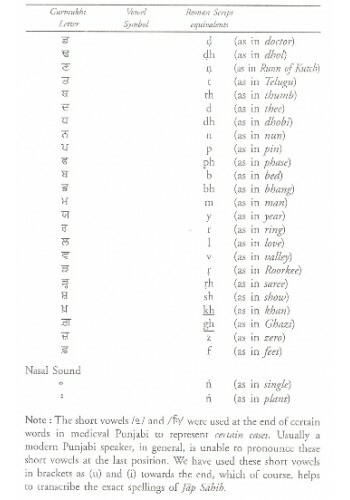 Thus, while the content of the unique composition is steeped in Shani Rasa (the aesthetic flavour of serenity), its form is steeped in Vir Rasa (the aesthetic flavour of valour). 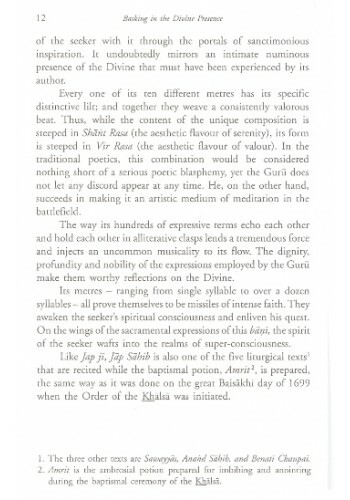 In the traditional poetics, this combination would be considered nothing short of a serious poetic blasphemy, yet the Guru does not let any discord appear at any time. He, on the other hand, succeeds in making it an artistic medium of meditation in the battlefield. The way its hundreds of expressive terms echo each other and hold each other in alliterative clasps lends a tremendous force and injects an uncommon musicality to its flow. The dignity, profundity and nobility of the expressions employed by the Guru make them worthy reflections on the Divine. Its metres - ranging from single syllable to over a dozen syllables - all prove themselves to be missiles of intense faith. They awaken the seeker's spiritual consciousness and enliven his quest. On the wings of the sacramental expressions of this bani, the spirit of the seeker wafts into the realms of super-consciousness. 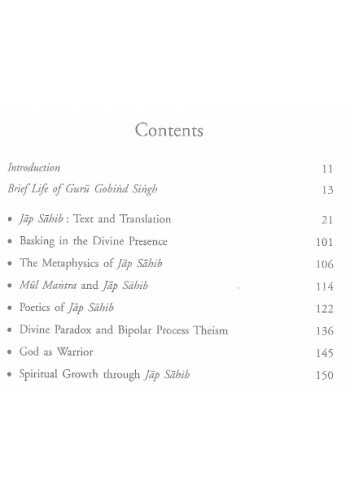 Like Jap ji, Jap Sahib is also one of the five liturgical texts' that are recited while the baptismal potion, Amrit2, is prepared, the same way as it was done on the great Baisakhi day of 1699 when the Order of the Khalsawas initiated. Summary of 'Sukhmani Sahib - The Fount Of Serenity' By Surinderjit Singh It is an English r..
Jap Vichar - Book By Kulwant Singh Bhandal ..